While none of the Co-Optimus staff is at E3 this year, unfortunately, we're still scouring through all the news coming out of the event to catch any tasty co-op tidbits. This particular one comes from Christopher Livingston over at PC Gamer, who details his hands-on time with 10 Chambers Collective's co-op FPS, GTFO. The depths of GTFO are to be approached slowly and cautiously, with careful coordination between your team members. It's not a game for bursting boldly into unexplored chambers spraying bullets wildly: there simply aren't enough bullets for that. 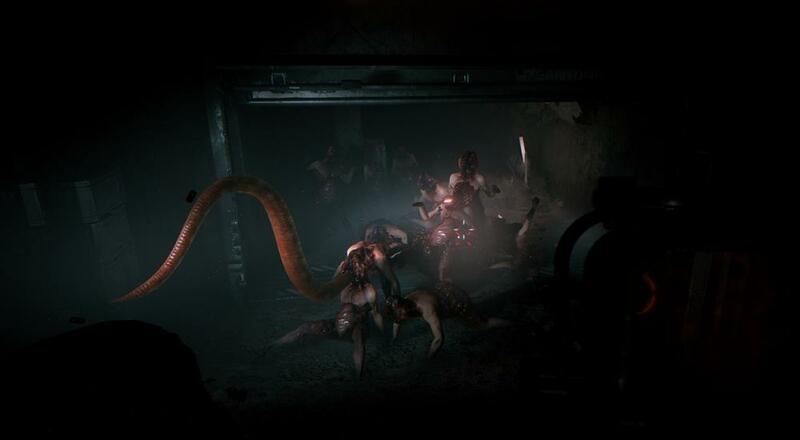 Ammo is scarce even from the start, and each area should be carefully combed for every last ammo pack and medkit, and then shared among the team depending on who needs it most... One rather alarming monster can't see you, but extends long creepy white feelers out from its head. Often upon opening a door we'd be greeted by these advancing tendrils, reaching out to feel if someone was there. If a tendril touches someone, and they often did, even as we tried to backtrack away or slip behind cover, the white tendrils would turn blood red and all hell would break loose. Beyond some seriously creepy monsters, you will have puzzles to face as well. The example Christopher provides in his piece is one player hacking a terminal to get a code, which then gets relayed to another member of the team that has to enter that into a terminal at a different location. It definitely sounds like 10 Chambers is focusing on the co-op aspects and working as a team. GTFO is set for a PC release sometime this year. Four player online co-op is supported. Page created in 0.6408 seconds.